How in the world can someone put together 18th century French history, Japanese animation, and zombies? Le Chevalier d'Eon shows us that anime has the flexibility to cover a wide range of genres that even occasionally leave the Land of the Rising Sun. Everything in Chevalier exudes quality. From the elaborate pacing to the incredible animation to the fantastic twists, this show is some serious high-quality stuff. Roughly based on the true escapades of Charles-GeneviÃ¨ve-Louis-Auguste-AndrÃ©-TimothÃ©e Ãon de Beaumont, often known simply as the Chevalier d'Eon, Le Chevalier d'Eon is a rich fantasy tale of deceit, loyalty, betrayal, friendship, and, uh... androgyny. d'Eon de Beaumont begins as a member of the French secret police, but when his sister Lia's body is found in a coffin floating down the River Seine, he joins the national spy organization known as "Le Secret du Roi," or "The King's Secret." Helping him are fellow spies Durand, a veteran of the King's Secret, Teillagory, a battle-hardened French knight, and Robin, the young aide to the Queen. The "four musketeers" have come together in order to help the French Crown discover and reclaim the secret of the "Psalm of the King," a magical Bible psalm that chooses which King will rise to the throne. Incidentally, d'Eon finds that his sister's soul has been trapped inside of his body, and that when she uses him to recite the Psalm of the King, she takes over his body and attacks his enemies with a fearsome rage. As the four search Europe for evidence the secret of the psalm, and try to bring Lia's torubled soul to rest, they meet various "Poets," or those who have mastered the recitation of the psalms, and use them both to manipulate others and to fight. In addition, their enemies often use their psalms to turn innocent people into zombies full of mercury blood, using these creatures to fight off the musketeers. Production I.G, known for their huge portfolio of quality work on a large variety of series, did a great job with animating Le Chevalier d'Eon. The backgrounds, colors, and costumes are beautiful, and they often seem like they came out of an authentic European painting rather than an anime. As usual, I.G handles the animation brilliantly, providing consistently smooth movement. This is most evident during the action-packed swordfights that occur throughout the series, when the characters move with incredibly exciting and realistic energy. The character designs are varied and very interesting looking, though they occasionally dip into lower quality. This change is jarring, and noticeable to even the least perceptive of viewers. In one scene, you will see a character's face beautifully lit and shadowed, and their face will wear a totally believable expression. The next, the art will seem strangely out of proportion, and the lighting will be cheap or nonexistant. Generally, though, the designs remain good enough for the occasional dips to be excusable. Plot is the most important part of a series like Chevalier, and that is of course where it really makes an impact. Starting off with an internal plot to overthrow King Louis XV, the King's Secret soon find a conspiracy that spans across all of Europe. Screenwriter (and author of the original novel upon which the anime is based) Tow Ubukata rachets up the suspense in every episode, making Chevalier a joy to experience on the first go-through. Characters and development are often overlooked in epics like Le Chevalier d'Eon, but here we can find a huge and fascinating variety of characters. As each of them battles with the true meaning of their loyalty to France, we see the complex (and ever-changing) personal stories of the characters. D'Eon's story is quite interesting, as he at once battles and embraces the ever-growing presence of his sister inside of him However, in the stories of such characters as Empress Elizabeth, the disloyal Russian Voronzoff, the naive Robin, who faces various points of disillusionment with the glory of being a knight, and of course the two knights Durand and Teillagory, both of whom are torn apart inside by a conflict between political and personal loyalties. In addition, the highly fantasy-based plot manages to cleverly weave in real historical figures and events to achieve a strange sense of historical accuracy in a world of possesive spirits, zombies, and magical psalms. For example, the real Chevalier d'Eon dressed up as a woman named Lia de Beaumont, and using this guise, became a valued advisor to Empress Elizabth of Russia. (as well as a French spy and ambassador) In the anime, Elizabeth often mentions her close bond with d'Eon's sister Lia. It's those sorts of clever references, along with a suspenseful plot and some amazing twists at the end, that make Le Chevalier d'Eon so enjoyable. Near the end, however, the only problem with the plot arises. With all of its intricate plotting and interesting elements, Chevalier cannot escape its inevitable flaw: overcomplication. At the end of the series, when all of the plotlines come together, director Kazuhiro Furuhashi takes his viewers on a strange, often surreal journey in which little makes sense. While the animation might be great and the understandable parts fascinating, all of the talk of psalms and kings and souls becomes a tad too convoluted. The Japanese dub is fairly good, with everyone giving a fairly dramatic and interesting performance. Robin and Robespierre's VAs are particularly good, exuding immature naivety and creepiness, respectively. The music is another great facet of this series. 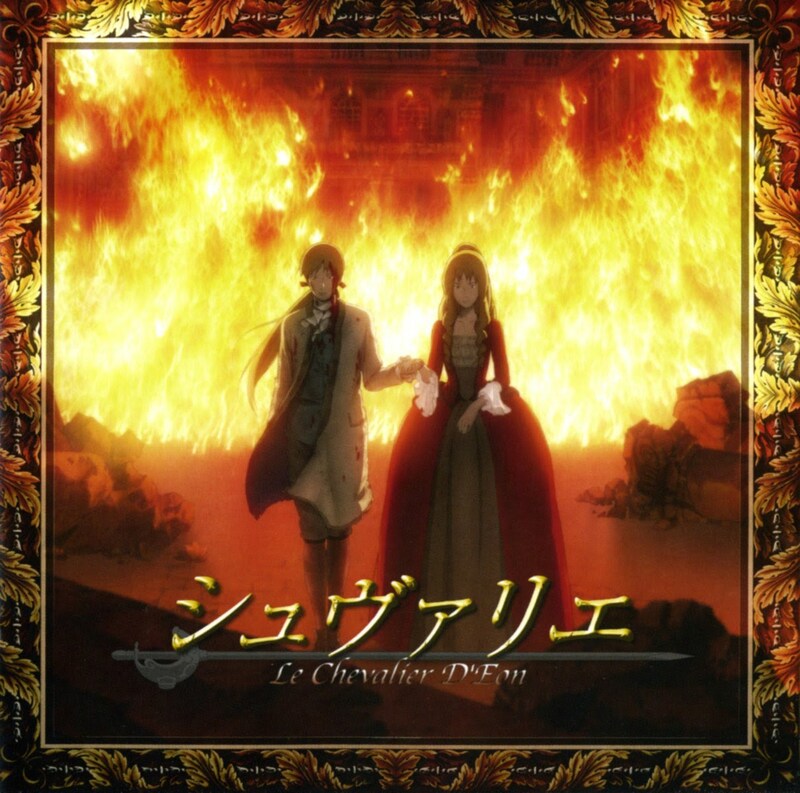 The score for Le Chevalier d'Eon is beautiful, and its violins and other classical instruments help to hold up the time period that the entire series tries to reproduce. Of course, the score is also used for raising the suspense, to great effect. Le Chevalier d'Eon is one of the best anime released in America in 2007. Its brilliant mix of historical fiction, horror, action, and suspense create a compelling tale that is both superficially entertaining in its action scenes, and intellectually stimulating in its intrigue. It suffers from some unever character designs, and the ending is slightly convoluted, but viewers will still find an entertaining experience in it. Chevalier is a highly underrated modern anime classic, mostly due to its odd choice of setting. Those looking for intelligent storytelling and beautiful animation need look no further than the gem that is Le Chevalier d'Eon.